An easy walk just north of Downtown, the Chinatown neighborhood lies on the south side of the Bow River at the foot of the Centre Street bridge. Both the Blue and Red CTrain lines and many Bus Rapid Transit and regular buses run nearby on the 7th Street corridor, just 3 blocks south. The permanent Chinese settlement in Calgary happened because of a double-cross. Like in the United States, the Dominon’s transcontinental railroad project suffered in part for lack of skilled workers, willing to endure the harsh climate, strenuous labor, and isolation from the rest of society. These were jobs that the majority of white Europeans who’d settled in the east did not want to do, regardless of the salary. And the solution the Canadian Pacific Railway found, much like the Western Pacific Railway in California, was to import labor from South China and pay them cheaply (for North America). As the C.P.R. was also a steamship company with routes to Asia, transit was quickly arranged, with the Canadian government guaranteeing return fare to China when the rail tracks were completed. However, once the line was finished in 1885, the government refused to pay for the workers’ return trip, and imposed a severe head tax on new Chinese immigration, trapping the laborers in Canada and unable to bring their families. So the double-crossed workers settled on the east side of the city – and then were kicked out by fire and, ironically, railroad expansion – finally taking root on the north side of downtown by 1910, when Chinese merchants and mutual-aid societies acquired adjacent properties (in much the same fashion as what happened in Chicago). Growth was slow due to the government’s deliberately racist Chinese Exclusion Act of 1923, which was not revoked (again like the U.S.) until 1947. While Calgary did see marked growth in its Asian population after World War II, like many other cities, the newcomers were just as likely to settle in the suburbs, and little development took place in the historic neighborhood. In the 1970s a proposal to run a freeway extension to downtown put Chinatown squarely in the crosshairs, and this was the catalyst for Calgary’s Chinese community to build political representation and economic development. The proposal was defeated (but spurred planning for today’s metro-wide network of light-rail and bus rapid transit routes) and the residents, associations, and businesses of Chinatown finally developed its own Development Task Force. By the 1980s this group had steered development of new housing, schools, retail and office space, and the Chinese Cultural Centre, ensuring its survival for another generation. Alberta fared better than most places in the economic troubles of the 2000s but this good fortune means that property values in Calgary’s core have soared and this has led to pressure for redevelopment in Chinatown, with new restaurants, retail, and housing coming on line recently. The neighborhood’s master plan has yet to be updated (with lots of planning to plan but no action yet), but property developers have already started asking for substantial variances to increase density and commercial space. Will Calgary’s Chinatown find a pathway in time to renewal and economic vitality without losing its cultural uniqueness and heritage? Or will it be consumed by copies of mixed-use high rises that look the same as buildings in Toronto and Vancouver? The Calgary Chinese Cultural Centre, at the intersection of 2nd Ave SW at 1st St SW, maintains a busy schedule of events and houses a museum in its basement with replicas of many Chinese artifacts, including furniture, tapestries, pottery, and Terracotta Warriors. 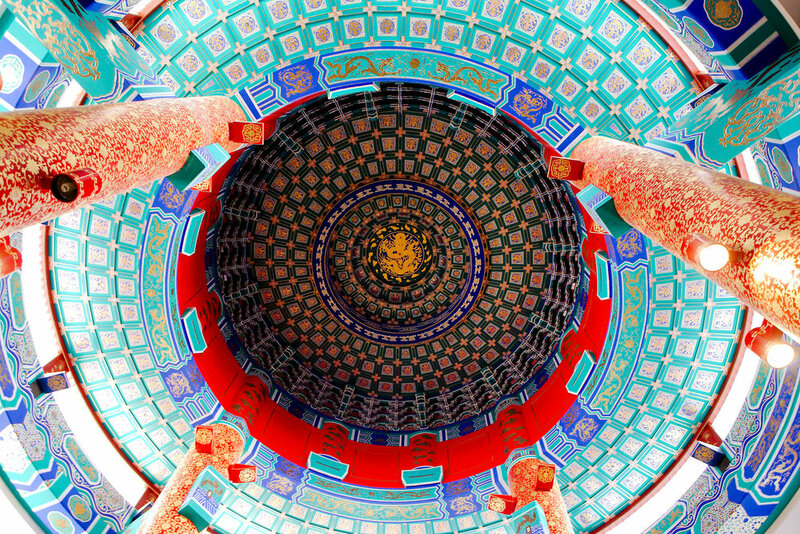 Above, the Dr. Henry Fok Cultural Hall rises 70 feet and is carved and painted to resemble the Temple of Heaven in Beijing – a can’t miss, eminently Instagrammable sight. Just north of the Cultural Centre and running along the riverfront is Sien Lok Park, which not only has walking paths (that continue in either direction as RiverWalk Calgary) but also is guarded by two white Chinese lions on its western end! Inside are two large stone carvings which commemorates the early Chinese gold miners and railroad workers of the 1850s-1860s. At the eastern end of the park at the Centre Street bridge, note the English lion motif. The Centre Street – 3rd Avenue intersection is the heart of Chinatown, with all four corners featuring small shops and restaurants. The two-story red brick building just further up on the northeast side dates from 1905, and Sun Yat-Sen had given a speech there. On the northeast side of Centre and 4thAvenue is the Dragon City Mall, which houses more Asian clothing and jewelry shops, anime-goods stores, travel agents, and several restaurants. Walk around to 1st Street SE and head back north to the river to complete the loop around Chinatown and see more small businesses and residential towers. Along the river, every August, the Calgary Dragon Boat Society puts on races and a big family-friendly festival (with free admission). In the summertime, keep your eyes open for practice sessions! The Calgary Tower is only a few blocks south on Centre Street at 9th Avenue, and boasts the highest 360-degree observation deck in the world. Across the street (1st St SE at 9th Ave SE) is the Glenbow Museum, featuring local fine art and culture as well as exhibitions of world artworks. The Devonian Gardens in the CORE shopping center, at 7th Avenue SW @ 2nd Street SW, offer tropical palms and plants, with fish ponds and a children's play area. The Calgary Zoo is not within walking distance, but is an easy bus ride from downtown, and it has panda bears on loan from China for several more years! It also has extensive botanical gardens, exhibits on the Canadian wilds, and even a dinosaur park. Just north of the zoo is the TELUS Spark science museum, equipped with a planetarium and lots of hands-on exhibits to appeal to both kids and parents. The neighborhood is quite distinct in the Census data. Click to open the fascinating University of Virginia Cooper Center map project to visualize ethnic patterns from the 2010 Census. The Cermak-Chinatown stop on the CTA’s Red Line “L” train is just steps away from the traditional entrance gate, and less than 15 minutes’ ride south of the Loop. By car, the Dan Ryan and Stevenson Expressways meet here. Cermak Road is the main access to the neighborhood; best to use the Wentworth Ave. parking lots and walk around as on-street parking can be scarce. Chicago’s Chinatown was the second major center for Chinese migration in the U.S., after San Francisco. The Transcontinental Railroad which spurred so many laborers to emigrate was also the pathway out of an increasingly anti-Asian California of the 1860s-1870s. Early arrivers built a small community inside the Loop, but in the 1910s, Chinese fraternal associations bought property and started construction in today’s location. Businesses, banks, and housing at affordable rates made it a natural choice for newcomers, as well as a “safe space” against racial discrimination and crime. Investment and expansion continued through the 20th Century to keep this neighborhood vital and attractive to migrants from China in the post-“opening up” era of the 1980s-1990s. People from all over Chicagoland know this neighborhood has some of the best dining in the city, especially its Dim Sum options like at Phoenix, Cai, and Triple Crown. 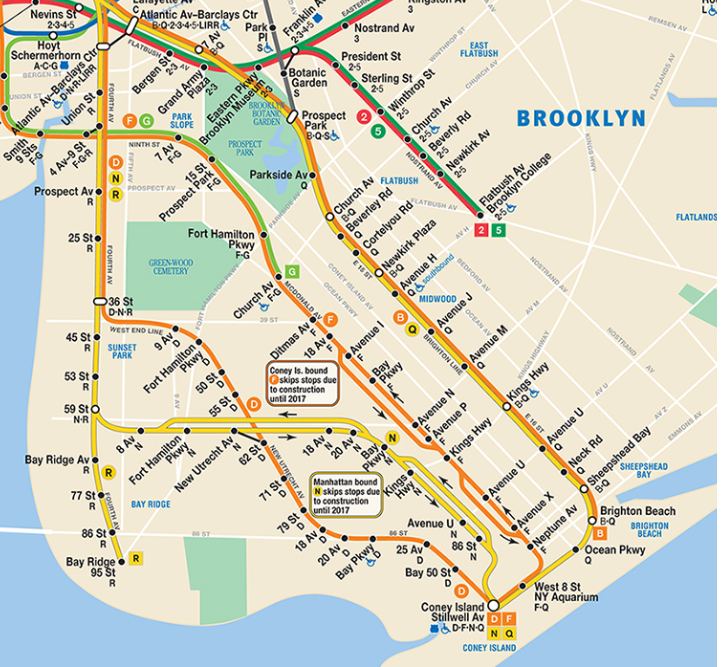 Eater has a wonderful map listing well over a dozen recently-reviewed restaurants. Chinatown offers a number of events throughout the year, including of course a Lunar New Year parade and a Mid-Autumn celebration. Each weekend on Temple Street in Chinatown Square there is a street market offering gifts, produce, and prepared foods. Chinatown Square itself, abutting Archer Avenue, is a newer two-story mall with a number of restaurants, groceries, clothing and gift shops. This area also includes the Chicago Chinese Cultural Institute, and just to the north, Ping Tom Memorial Park along the South Branch of the Chicago River. The park has walking paths, an activity center, kayaking, and even water shuttles during the summer. Even more variety of shopping can be found along Wentworth Avenue, the heart of the old neighborhood. Bakeries, kitchen-supply shops, and antiques are all fascinating stops to make. You’ll also find the small Chinese-American Museum of Chicago at 23rd Street, a half-block west of Wentworth. At the southern end of the neighborhood along West 24th Place is tiny Sun Yat-Sen Park. One stop further south on the Red Line will get you to USCellular Field for a White Sox game. One stop further north is the Roosevelt station; on a pleasant day it offers a nice walk to Lakefront for the Field Museum and Shedd Aquarium.